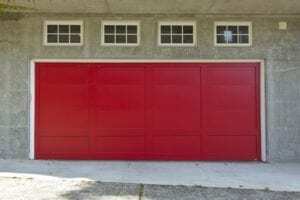 Home » Blog » Garage Doors — Which is the Correct Style for Your Home? Garage Doors — Which is the Correct Style for Your Home? There are three main types of garage doors. Those including the standard overhead doors, carriage house doors, and the classic style garage doors. Within each of these basic groups are many styles of garage doors. So which is the right style of garage door for your home? The answer to that question depends on the style of your home. Let’s take a close look. Most people who are shopping for a garage door start with the aesthetics. What looks the best. However, garage doors have a job to do and that job is to help keep your belongings safe, provide access to your garage, and to improve the look of your property. So your goals in choosing a garage door should include security, beauty, and dependable access. Standard Overhead Garage Doors work well on most buildings. They are usually constructed of metal and provide easy access via remote openers. These doors fit nicely into attached garages where the garage is an extension of the house. They are often installed as a recessed door providing a frame-like effect. They are pleasing to the eye, and they incorporate nicely into your homes design. Carriage house garage doors are perfect on detached garages. They can open outwards, like a barn door, slide along an inside or outer wall, or they can be modified to lift open like an overhead door. They can be made of wood or metal and they carry a design that fits into historic and estate type buildings. Carriage House garage doors work well to extend the design aspects of rustic to modern buildings. Classic style garage doors feature a refined look as though they are created by a fine woodworking master. They are available in metal or wood, often feature glass windows, and a variety of casing shapes, such as a gentle arc. These doors go well with attached garages or on outbuildings. Classic Style garage doors offer security, even when made from wood. Here are some tips on making any door more secure. Which garage door you choose is important because doors are the first things that greet visitors. They are often the most dominant feature in a home’s exterior. So the style should fit into your existing architecture in a way that welcomes people to your home and that is pleasing to look at from the street. If you would like more information on garage door styles or some help in identifying which garage doors you should consider, just give us a call or contact us online.